This is one of those photos that tells quite a story, although I'm not sure what that story is. 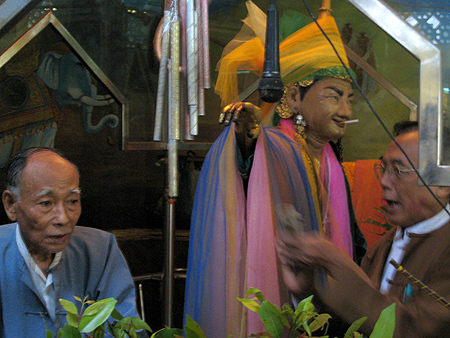 This photo was taken in a Buddhist temple in Rangoon, Burma, and the man on the right is draping some silk fabric on a happy looking statue that also happens to be smoking a cigarette. It seemed to be some sort of merit making exercise. The guy on the left has a priceless expression that says, "Seriously, I gotta get out of here, this is way too weird for me. I crave normalcy and I'm not getting it here." I tried to find out more, but language barrier, in addition to this being a place of worship, made me quickly realize the immensity of the task. So I have no idea what's going on here. But that can be a point in itself. Things don't have to always make sense to be awesome, and this is just the latest example of the world's rich tapestry of weirdness.